All products essential to the activity of a discount store. Ideal for all professional discount, exporter or wholesalers, resellers or … fairground. This lot are an excellent value compared to the market price report. Rates from 189 euros / palette to a minimum of 90 pallets. 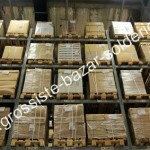 Pallets primarily from litigation transport. To request a listing on the National or export, please contact the sales department on (33) 02 46 56 50 40 or by e-mail.